August is less than a week away, and that means we are approaching the hottest time of the year. Even though it has been a mild Summer so far, the 10-day forecast is calling for temperatures to reach the 90s. As the temperature increases, it is critical to keep your elderly loved one hydrated and at a safe bodily temperature to prevent heat-related illness. In fact, although the Center for Disease Control warns that everyone is at risk of suffering from heat-related illness, the CDC recommends to keep an extra careful watch on elderly loved ones. During hot spells, there are many ways to keep your elderly loved one cool and safe. In the past we have blogged on ways to reduce your elderly loved one’s risk of experiencing a heat-related illness including: drinking cool beverages, avoiding alcohol and wearing lightweight clothing. These are all great ways to reduce your loved one’s risk of heat-related illness. Another great way is to keep your elderly loved one comfortable in a living space outfitted with an air conditioning machine. However, air-conditioning units are often associated with higher-than-normal electric bills, and on a limited income, this could become an issue. In this week’s blog, we will explore ways to maximize your air conditioning while maintaining a reasonable electric bill. Much like our bodies, air conditioning units need check-ups to make sure they are running at peak performance. A licensed HVAC specialist will be able to inspect it and tune it up for a reasonable cost. If at all possible, keep your unit in the shade or build a covering for it. Air is naturally cooler in the shade which makes it easier for your air conditioner to cool the air and use less electricity. You will also want to make sure that there is no shrubbery around your unit, as this blocks the air intake and makes it work harder. Be mindful of where the thermostat in your elderly loved one’s house is located and make sure that you refrain from placing lamps, televisions and other heat producing appliances near it. If adding a new thermostat, it may be helpful to put it in a shaded part of the house. 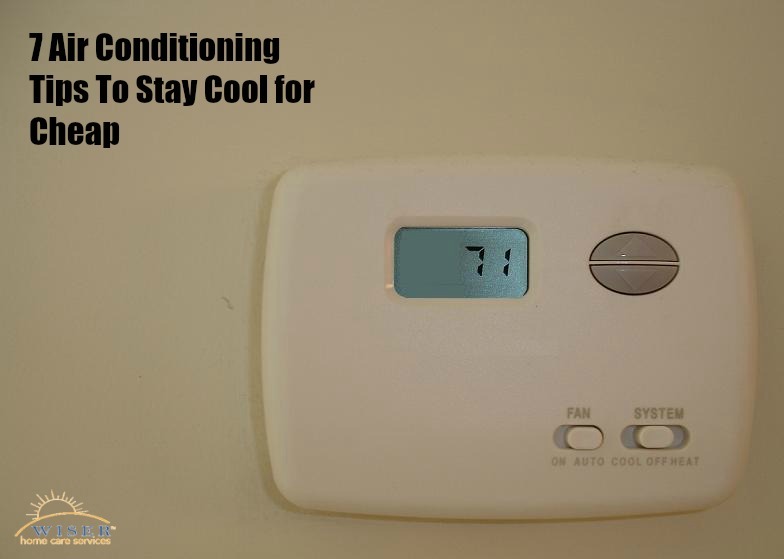 This will prevent your air conditioner from over-compensating for a poorly placed thermostat. Many people think about weatherizing in the winter when they want to prevent heating the outside. The same is true in the Summer with cooling. Making sure your windows and doors stay closed and there are no cracks where air is escaping will reduce your cooling bill. As we mentioned earlier, the more shade around your house, the easier it will be to keep cool. In addition, avoiding landscaping elements such as stone work or paving will help reduce the temperature around your house. If your elderly loved one’s house has fans and you can rest comfortably in front of a fan, this will be a great alternative to air conditioning. Research suggests a typical fan uses about $1.50 worth of energy each month, compared to $25 per month for an air conditioning unit. We hope this helps keep your elderly loved one cool and safe as we experience the hot August days. Many public places including senior centers and public libraries have air conditioning and encourage senior community members to take advantage of it if they need to.